The Singh-Ray 82mm Vari-ND Variable Neutral Density Filter gives you control of up to 8 stops of light, all in a single filter. Just rotate the filter ring to increase or decrease the ND filter effect. This type of filter is especially useful for shooting video, or when trying to achieve a long exposure during bright sunlight. 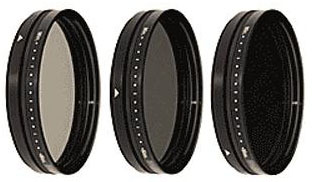 The design of the Vari-ND Filter may introduce irregularities when used with very wide angle lenses, especially on full-frame cameras.